My rooftop garden has been a meditative journey, just like my yoga practice that teaches me: patience, freedom, strength, balance, flexibility, gratitude, self-determination, awareness, courage, respect and love. That is all a mouthful — but it is true. My challenges and joys are real, similarly to my farmers who I have become in awe of. Once I started growing my own food, I began to feel more connected to the earth, even though I'm gardening from a 360° sky view. Loving the earth from above has its advantages. Sometimes I feel as if I'm in a tree house, gardening with the birds who will sit on the trellis at times while I snip and clip. The bees always find their way to the top and buzz around the chicory puntarella that I let flower for pollinators. When I look below I see the wild turkeys and deer look-up with curiosity as they go about their business eating yard bugs and clover. If they only knew what was growing on the rooftop; the turkeys might know because they do perch in the trees at times. The deer, no chance, unless Rudolph is real. I'm sure some of you are wondering why my husband Chris and I decided to create a rooftop garden. When we began designing our sustainable home Sheridan Green we always knew we wanted a garden. As we got to know the property intimately we noticed many deer and an abundance of other wildlife that would have enjoyed a free salad bar. Instead of fighting with Mother Nature's creature's (who we are very fond of) we raised our garden to the roof. Last year, was the first season we began to grow our own food and it surely was a learning curve. I was not focused — so much— on the varieties (heirloom vs. hybrid) I was planting, but more of the what's in season, when and how. After that growing season I pondered on varieties and the: why does it make more sense to plant an heirloom (open pollinated) tomato over a hybrid? My go-to farmer Stephanie Gaylor of Invincible Summer Farms, the Long Island Regional Seed Consortium and Salt of the Earth Seed Company is my mentor and friend. She grows rare varieties of vegetables for her farm, for seed trialing and preservation, and seed breeding. I'm in awe of her perseverance to resist the usual and plant to preserve food diversity as an action and a practice. Heirloom for me means: more nutritious, open-pollinated so I can save the seed from year-to-year, locally-adapted to our terroir (seeds that have been selected to grow well in our region), exceptional taste, and the historical and culinary stories of these varieties that have been grown for many centuries from around the world that we can cherish for years to come. This year, my (two) 5' x 18' garden beds are filled with rare heirloom varieties like: eggplants, beans, snow peas, tomatoes, greens, leeks, peppers, fennel, tomatillo, chicory and kale. The majority of the plants and seeds are provided by Stephanie, and a handful are seeds I saved from last year. Soon, a fall crop of carrots, beets, kale, greens, and radishes will be planted. I'm passionate about varieties that are on the Ark of Taste, an international catalogue of endangered heritage foods that are maintained by the Slow Food movement that is designed to preserve at-risk foods that are sustainably produced, unique in taste and history and part of a distinct ecoregion. The Long Island Cheese Pumpkin is a local variety that is on the Ark of Taste and was saved in the 1970's by a local seed saver Ken Ettlinger. 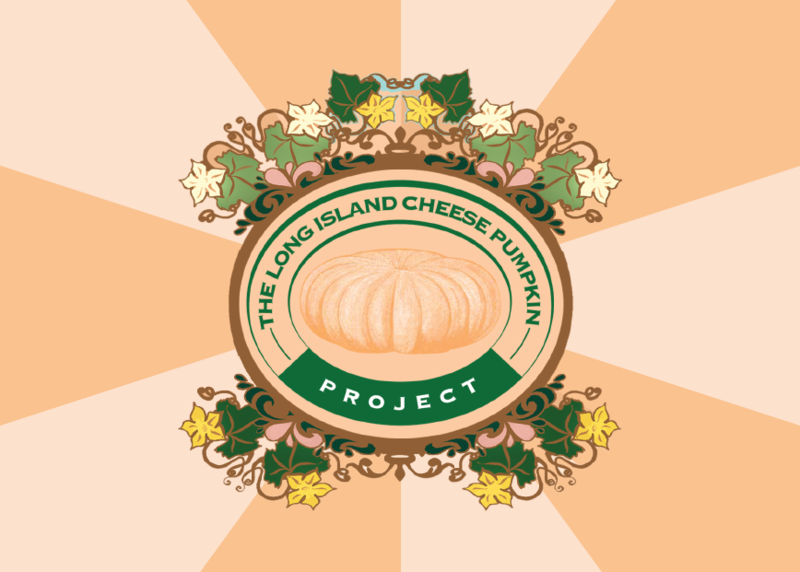 I partnered with the Long Island Regional Seed Consortium as an Ambassador and Coordinator for The Long Island Cheese Pumpkin Project to spread the word about this pumpkin through educational events and grow outs to revitalize this variety from the farm and garden to the palate. Aunt Molly's Ground Cherry (part of the nightshade family, tastes like a tomato crossed with a pineapple and a strawberry) is on the Ark of Taste and is being grown in my garden, along with the Shinnecock Currant Tomato that was grown by the Shinnecock Indians here on Long Island and a variety that I will be nominating to the Ark of Taste when I proudly attend as a Slow Food East End delegate at Terra Madre Salone del Gusto in Turin, Italy. Stephanie Gaylor has adopted this orphan variety that is on the verge of extinction, (only one or two people in the world have this seed) and has been cultivating its viability for the past four years in hopes to be released in 2017 (it takes approximately five years to cultivate a seed; grow, save the seed and repeat). Terra Madre Salone del Gusto is the most important international event dedicated to food and gastronomy that is composed of exhibitors from five continents, numerous events dedicated to the wealth and diversity of global cuisine, conferences examining issues around food production, forums of Terra Madre’s food communities and how our food is made, preserving biodiversity and securing a better food future for everyone. The theme of this year's edition is Loving the Earth. A perfect theme for a girl who loves the earth from a rooftop garden.